You are here: Home / Academics & Academia / Is Open Education a Movement? Phil and I had a wonderful time co-keynoting the OpenEd 2015 conference. It was a hoot. There have also been some other interesting virtual conversations growing around the conference, first over Twitter and now in the blogosphere. Some of the ones worth reading that I have seen so far include those from Maha Bali, Clint Lalonde (parts one and two), Robert Farrow (who also captures some of the tweets), and Robin DeRosa. Phil and I approached our keynote as analysts because we figured that's probably the main value that we have to offer. We wouldn't presume to tell people what open education "should" be about, but given any particular "should," we're pretty good at thinking through how to achieve it. For my part of the talk I used the analogy of building the climate action movement because the open education community often speaks of itself in the language of a movement and because I happen to have some experience in that area. And if you read some of the posts I mentioned above, you will indeed see varying degrees of movement language. But there is an underlying question that really should be addressed explicitly: To what extent is it accurate or useful to think of open education as a movement? If your goals are near the bottom of that list, then you don't need much of a strategy, which means you don't need (or want) a movement. If your goals are near the top, then you definitely need a strategy and you might need a movement. One of the subtleties of movement building is that you are always trying to move people further along the list from low ambition to high ambition. (Maybe that's why they call it a movement.) If you're an open education organizer, maybe somebody comes to your meeting for the first time because she is interested in using OER for her own class. You want to get her hooked. Maybe you want her to try open teaching practices in her own class. And then maybe you want her to show her colleagues what she's doing and convince them to do the same. And then maybe you want her to organize her colleagues to go to the administration and advocate for college-level support for fostering open teaching practices. And so on. Your goal is to encourage her to move up from the thing that she cares about---the thing that brought her in the door---to the things that you and she both care about. Bigger things that you can only accomplish together. For me, part of what separates an actual movement from movement talk is having a clear ladder of ambition that forms the framework for movement organizing activities. There are actually a number of claims packed into this tweet, including that the open education is being equated with OER and that OER is being equated with free, and that free curricular content is being equated with free textbooks. And then there's the question of what it means for one to be "equated" with the other. Equated is a strong verb. But I want to focus for the moment on his conclusion that, assuming that open education is being equated with free textbooks, "the movement" will be less compelling. I interpret "less compelling" in the context of the scenario I just presented to mean that you (as an open education movement organizer) are less likely to get people to come to your meetings and less likely to get them to climb that ladder of ambition. Is Jim's claim true? Probably not for educators in the developing world. If you live in a developing nation where the choice for your students is a stark, binary one between free educational resources or none at all, then free curricular materials is not a narrow issue. This probably why the first global declaration on OER was written in Cape Town, South Africa. The question of whether OER are compelling enough to be worthy of attention is a First World problem. But Jim lives in the First World, and there is a legitimate question of the degree to which a focus on OER makes open education more or less compelling to First World educators who might be interested in open education. Let's look at both sides of it. I'm going to return to my keynote analogy of climate organizing because, again, it's something that I have some experience with. A natural gas company is proposing to run a major pipeline through our area. In our local climate change organizing meetings, we have a choice about how much of our time and energy we want to focus on fighting the construction of that pipeline as opposed to, for example, pushing for state-level carbon pricing, fostering local uptake of renewables and energy efficiency, or advocating for fossil fuel divestment. Will a strong focus on the pipeline increase or decrease participation? On the one hand, we have found there are a lot of people and businesses in our area who may care about climate change, who might even consider them selves green, for example a local restaurant who recycles its used grease with grease-cycle.com, but are less motivated to take substantial and sustained action to prevent it than they are to prevent the construction of a massive pipeline that would carry up to a billion cubic feet a day of pressurized, explosive methane gas near their homes, schools, and parks. There is no question that the pipeline has been a huge driver for our growth. On the other hand, it is also true that if we only talked about the pipeline, if we "equated" climate activism with pipeline activism, then other participants would not show up. (I am one of those other participants.) It's not an either/or situation and a lot hangs on the meaning of that verb. But on balance, we have had ample evidence that a focus on the campaign to stop the pipeline has done much more good than harm, especially because, while we do focus on the pipeline, we do not equate the campaign goal with the movement goal. We think globally but act locally. My sense is that a focus on OER can and often does drive participation in open education in a similar way, despite the fact that I don't yet see a clear, movement-defining ladder of ambition. 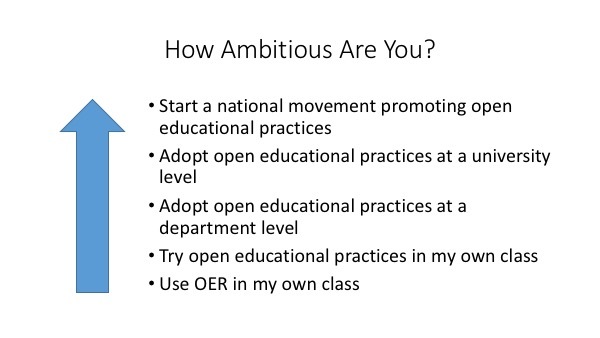 My sense of #OpenEd2015 is that there was widespread interest in ambitions beyond open textbooks but, lacking a clearly articulated ladder of ambition, there wasn't a lot of focus on it. But there is a deeper question related to the appropriateness of the "movement" label for the open education community represented at #OpenEd2015: What's at the top of the ladder? If free textbooks are not the ultimate goal, than what is? I have yet to hear one clearly articulated. What is open education? How will we know when it has been achieved? I hear movement talk about more radical ambitions, but I don't know what's at the top of the ladder. And to the degree that people don't know what's at the top, they are less likely to start climbing. Sometimes I think that open education, writ large, is actually the opposite of a movement. It is a critique in the critical theory sense of the word. Maybe the OpenEd community is partly an affinity group for people who feel a deep sense of dissatisfaction with the state of our modern education system. People who feel that it is canned, prepackaged, and dehumanizing for students and teachers alike. They don't like that courses are often about transmission of content that is packaged up by a corporate entity and sold to students at great cost. They don't like that large computer systems created by other corporate entities and purchased (or, more accurately, rented) at great cost by the university become the virtual classrooms and shape pedagogical affordances. They don't like that, in this model, faculty are reduced to repeaters of content and students are reduced to memorizers of content. They believe that these are all related symptoms of larger structural problems in our educational system.They see clearly the things that they don't like. The better alternative system and means for achieving it are less clear. "Openness" seems to capture the spirit of values that various participants in the community are trying to articulate, so that becomes the banner. But to the degree that OpenEd is fundamentally based in critique, critique is much better at taking things apart than it is at putting them together. And wrapping that critique in movement talk doesn't change that fact. If you want a case in point of how wrapping a critique in movement talk will fail to create a movement, look no further than Occupy. What's the main thing that people remember about it? What's the first thing that the average person who wasn't an Occupy protester will tell you about if you ask them to tell you about Occupy? People in tents in city parks. What were they trying to accomplish? I doubt that even one out of ten people can answer that question. And once the tents were packed up, the "movement" disappeared. Oh, there were a few local victories and successor organizations that have done some good, but those mostly exist where very specific goals, e.g., labor contracts, were presented under the banner of Occupy. The successful branches were thinking globally but acting locally. The larger thing just disintegrated, because it was not a movement but a critique of the current global distribution of wealth and the power structures that sustain it. Regardless of the merits of that critique, it had no ladder of ambition or strategy for getting people to climb that ladder. A ladder of ambition is a ladder of a participation. It is a structure for bringing more people together to achieve more ambitious but commonly held goals. There is a reason that the core activity of a movement is called "organizing." It is possible to have both critique and movement that are complementary. But they are not the same. I worry that complaints that OpenEd is not sufficiently radical may equate with the complaint that any set of goals that is sufficiently specific enough to form rungs on a ladder of ambition is not sufficiently radical to support the expansiveness of the critique. This is one way that movements commit suicide. But another way is to focus on the instrumental and achievable while taking for granted that you will somehow get around to the bigger goals at some indeterminate time in the future, or that they will take care of themselves. Instrumentalism and aspiration must be connected with a strategy. OpenEd does not have to define itself as a movement in order to be useful or successful or worthwhile. It could be an affinity group driven by critique. It could be a community of practice. It could be a professional development conference. It could be some mix of those. Those are all fine things to be. It can also be a movement. But to the degree that it wants to be one, then it must be organized around a nested set of increasingly ambitious goals and strategies that are clearly defined and achievable in scope.